The first weekend in September is the annual Folk Festival, one of my favourite weekends. My memories of the weekend over the years have been of hot, balmy weather, friends and family visiting and folk music filling the air. I listened to the open air concert in bed last night and just felt relaxed and happy, I’m not sure who was playing but the reception was very warm. 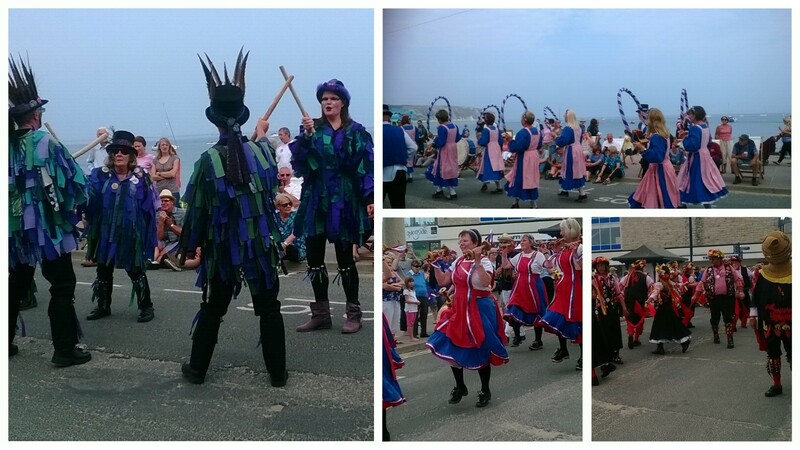 All over the weekend, there are many bands playing in various locations and one of the highlights is the procession through town of the folk dancers ending at the beach. Little Miss and I went down to the festival this afternoon to visit the main area, stalls, bars, music tents etc.. The craft tent is always very impressive and gave me lots of inspiration. We finished the afternoon on the promenade to see the dancers. There was such a variety of dancers, music, styles and colours in the procession, I lost count of the different troops. Little Miss did enjoy most of the dancers although she found some of the mummies rather frightening preferring the more traditional morris dancing and the straw animals which were mascots. The music is so simple with the accordions and fiddles and the whole weekend does make you reflect on and celebrate our cultural heritage.